I am always interested in sports arcade games. As much as I love simulations and realistic sports games, it’s nice once in a while to kick back with a game that doesn’t take itself seriously. 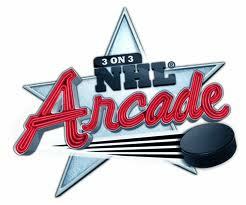 That’s why I was curious about 3 On 3 NHL Arcade, which was recently on sale for $2.50 (half off its regular $5 price). Unfortunately, I’m not sure it’s even worth that ridiculously low price. 3 On 3 is hockey in its most exaggerated, yet basic form. There are no teams, just blue versus red. There is no depth, just a quick match either by yourself or against a friend. Upon selecting a team color, you choose three players out of 40 total (no difference between them, except they are labeled as either “fast” “strong” or “all around”), and a goalie (again, no difference). Set a goal total and a difficulty level, and you are off to the races. The actual gameplay is decent. You are given the ability to use old-school controls or the new analog stick system from recent NHL games. To maintain its “arcadey” feel, occasionally the game throws in a handful of Mario Kart-esque powerups onto the ice. There are powerups to make either goalies or players big and small, speed boosts, 2x goal multipliers, and even the ol’ banana peel. Needless to say, games can get pretty hectic with all of the crazyness happening on screen. 3 On 3’s big problem is that there just isn’t enough to do. Playing quick matches over and over again gets old, especially if you are playing solo. By the time you hit 20-30 minutes of action, you will probably be sick of the game. Some more game modes or mini-games would have boosted the replay value. I also had a serious issue with the sound effects used in the menus. There is an obnoxious sound effect every time you hit a button. I don’t know who’s bright idea it was to do that, but it is freakin’ annoying! In short, 3 On 3 is decidely average. It has sound gameplay, but it is sorely lacking in replayability. I can’t complain too much since I got this game for less than the price of a pint, but I can’t help but feel it could have been so much better.